If you are an overweight woman and you tell someone you are trying to get pregnant, nine times out of ten, this is the response. It’s often disguised as well-meaning advice, they are only looking out for your health and happiness. But there is more to it than that. This question is loaded! Let’s get down into the what people are actually thinking and how we can deal with this statement. They probably already know you’ve tried to lose weight MANY times in the past. If they are a friend or relative, they will know the many diets you’ve been on and times you’ve tried to lose weight. The hidden meaning in this phrase is often – have you really tried to lose weight? You obviously don’t want to get pregnant enough if this is what’s stopping you. If you know they fall into this camp, explain to them that 98% of diets do not work and that when you go on a diet, your body actually slows down your metabolism to try and stop you losing weight. Your body also kicks the cravings up a notch so that you eat high calorie foods. After all, your body can’t tell the difference between a famine and a diet, it’s trying to keep you alive! If they aren’t interested in learning more about this, then tell them that your weight is none of their business! By asking if you’ve tried losing weight, they are assuming that you are basically eating crap and not moving your body. If you think they are assuming that you are unhealthy, tell them that you can be healthy at any size. They may also be assuming things about you as a person based on your weight and if that’s the case, then I wouldn’t even give them a second thought. Fat people are not lazy, stupid, greedy, unmotivated, blah, blah, blah. They believe that fat can stop you from getting pregnant. We are told over and over that being fat is the root cause of fertility issues. But it’s far more complicated than that. If you have PCOS then that may lead to weight gain. PCOS can also cause ovulatory issues but that doesn’t mean that the fat is directly causing the problem. Studies have shown that fat women do not have a significantly lower chance of getting pregnant when compared to women who were not fat. The research also showed that they didn’t have significantly higher risks during pregnancy or affect the health of your child. I believe what is way more likely is that years of yo-yo dieting and elimination of fat from our diets has resulted in our bodies not being able to function properly. When you start to nourish your body and give it the food it needs to grow and repair then your body can get on with it and heal itself. There is also the idea of a self-fulfilling prophecy. 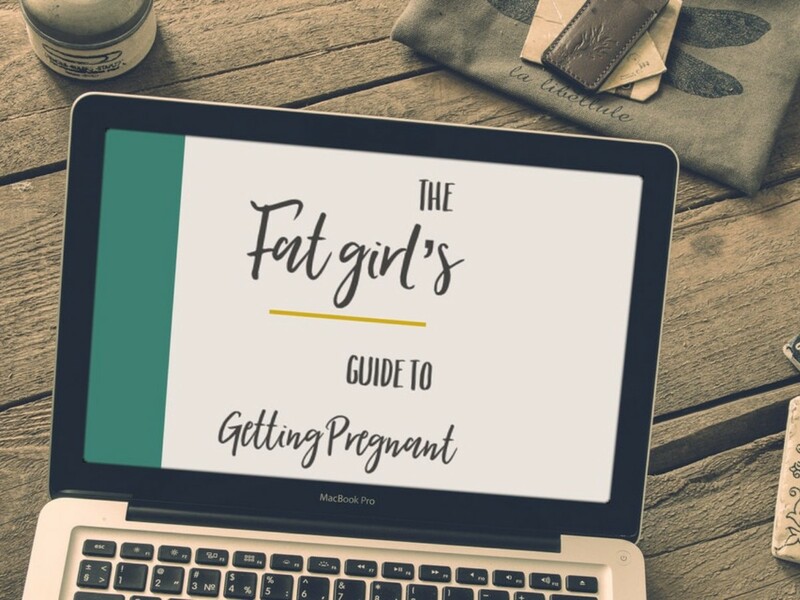 If you believe that you can’t get pregnant because your fat, how likely is it that that is going to come true? Fat is not the obstacle in your way. But the hatred you hold for your body and the way that you punish your body with a restrictive diet and punishing exercise might be. The easiest way to deal with all these issues is to remove them from your awareness. Unfollow people on social media with negative views. Tell people who bring up your weight that it’s not an open topic of conversation and frankly none of their bloody business. Ask your doctor to read the latest research around weight bias. Above all our worth as people is not dependent on the number on the scales or our health, contrary to popular belief. You are worthy of becoming a mother exactly as you are.